Hola!! Happy Cinco de Mayo or as I like to call it, Cinco de Mallory! Mallory is my youngest daughter and today is her birthday – she was born 5/5/05 at 5:55 pm. I mention this every year because do you know how hard it is to time something like that just right? Who’s got labor and delivery down to an art??? THIS GIRL. We celebrated her birthday yesterday and I had a piece of cake. Why is this extraordinary? It’s not. But what IS extraordinary is that I have come to realize that cake doesn’t really do it for me anymore. I don’t really care for a piece of cake sliced and served up on a plate, no, what I do care for is cake eaten straight out of the box, sliver by sliver. THAT is how I like to eat cake. Upside is, I don’t eat as much cake overall, but the downside is that I’m still eating cake. So I don’t know if this is progress or maybe just an interesting observation, or what. But anyway…yeah…cake. Oh hey, guess what else I did this weekend? 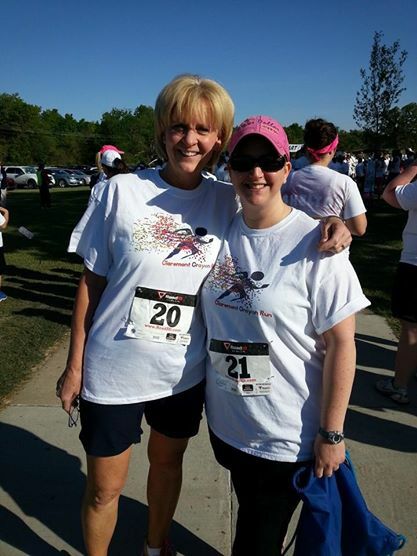 On Saturday I ran/walked a 5k with my very good friend Cindy. Our time was 47:19 – not a bad time for me!! We walked briskly and ran quite a bit as well, and it was a good thing we finished when we did because I was running out of steam towards the end. After the race, there were bananas and granola bars and…DONUTS for the runners. So many boxes of donuts…you’ve never seen so many donuts in your life! It was crazy. But when it’s 80 degrees at ten in the morning, you know what doesn’t sound good? Donuts. I walked right past those sugary confections without a second glance. Got me a nanner and some water and I was happy. Cindy and I pre-race. So clean and un-sweaty! So after the 5k Cindy and I left to do a bit of shopping (for two hours) and while we were shopping, I could feel myself getting ready to crash. I had coffee (and eggs with avocado) for breakfast about 2 hours before the race, then a bottle of water afterwards, but that’s all the liquids I’d had for the day. I was feeling NOT GOOD. Cindy really wanted to eat Chinese for lunch, which at that point nothing sounded good to me, but it used to be “our thing” so we went to a Chinese buffet. I had lots of chicken and vegetables and a small bowl of ice cream (the ice cream seemed to help but I still wasn’t feeling very good). By the time I got home, I felt just awful. I was super tired, I had a headache, and I felt like I was coming down with a cold: I felt sniffly and I was starting to lose my voice. I drank 3 16oz cups of water and took an ibuprofen and went to bed. I slept for about an hour and after that I felt a little better, but man I was just wiped out for the rest of the day! I kept drinking water all afternoon and evening and by bedtime I was starting to feel a little more myself. Not sure if I was just dehydrated, if I overdid it at the 5k, or if it was the Chinese food. Most likely it was a combination of all three. Note to self: don’t do that again! So that’s my weekend recap. I’ve got more stuff to blog about soon – a couple of reviews that are long overdue, a guest post from a new reader, and a list of stuff I have recently fallen in love with (yes I am ending this sentence with a preposition. Sue me). So prepare to hear more from me soooooon. Feliz Cinco de Mayo!! Is it too early for a margarita? I’m pretty sure dehydration was the major issue here! You’d only had a very little liquid for a hot day and a challenging run. The high sodium content of Chinese food would have exacerbated the situation. About an hour before I do a strenuous 1.5 hour workout with intensive aerobics and serious weight lifting, I drink 1.5 litres (sorry I only understand metric) of water. Following the workout I drink another litre and that is only by 8am with more water the rest of the day. Happy birthday to her! And yes, that dehydration! Eek! I hope you are feeling much, much better! WTG on the 5k! I think that is so cool about your daughter’s birthday. I told my family, and they thought that was pretty neat, too.